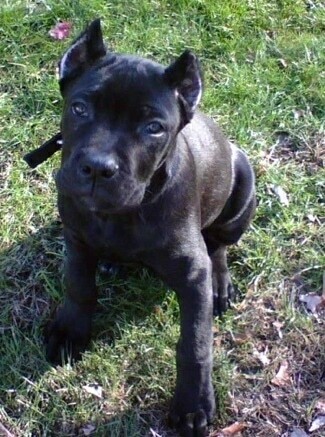 "Cane Corso puppy Clyde was 13 weeks old and 26 lbs. at the time this picture was taken. 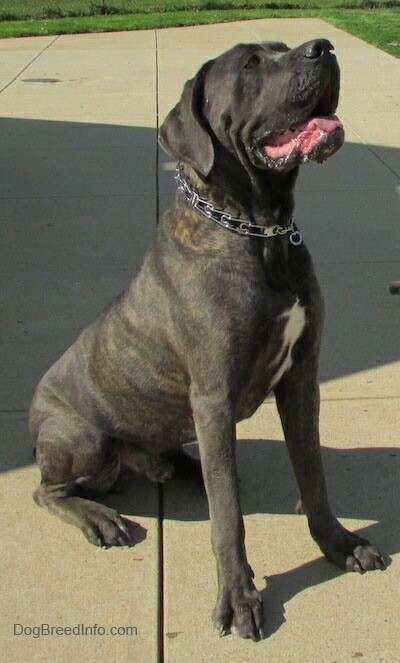 We bought Clyde from Avalanche Kennels in South Carolina (Kim and Lee Chapman couldn't possibly be any nicer people who absolutely love their animals!). We've used the DogBreedInfo site as a pivotal tool in helping us to understand different dog breeds, particularly with regard to dogs' stated temperaments and health considerations. 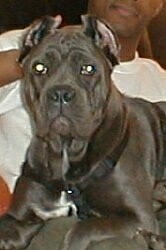 Through your site and the fairly extensive research that I've put into the breed, we decided that a Cane Corso was the dog for us. I've had German Shepherds and a Rottweiler in the past but wanted a bit different dog this time around." "We already own a beautiful 2 ½-year-old female chocolate Lab with outstanding temperament named Carly. 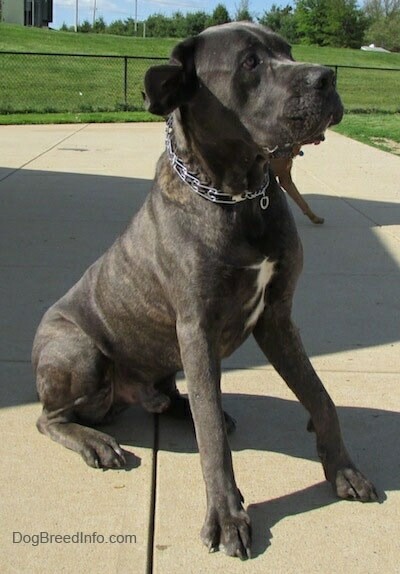 Wanting another member of the family first and foremost, a playmate for Carly, and a potential protector of the home, the Cane Corso appealed to us. 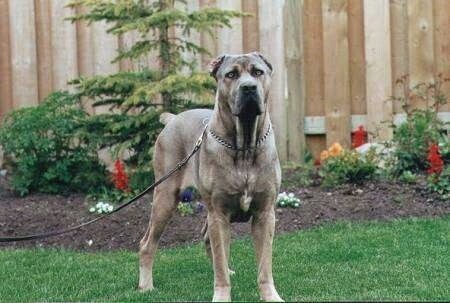 Having 2 kids, ages 13 and 11, the dog's loyalty and devotion to all was a must." "Once we decided to buy through Avalanche, our only concern was temperament. We didn't care about show-quality stock, color, size, anything else. 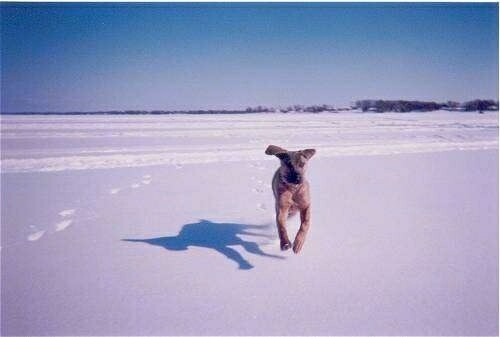 Of course, we wanted a puppy from a proven line with regard to health and temperament. But beyond that, our only request was for a male, which we thought would get along better with our Carly, and we wanted a puppy that had shown a clear gentle and loving disposition. 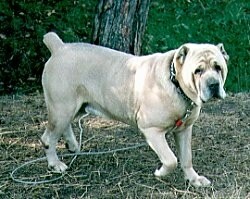 Kim stated that she had such the pup and Clyde has proven to be exactly as she claimed, even better." 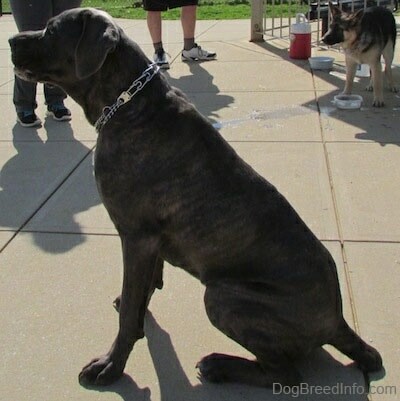 "He's still only 14 weeks (13 weeks and 26 lbs. in the photo) but is such a loving, obedient, and gentle puppy. No nipping or roughhousing. He truly loves to play but he never overwhelms us with his energy as he tends to want to play with us rather than set the tone himself. He's very smart, quickly learning "sit," "stay," and the all-important "come" commands." "We view his calm and gentle personality as a great foundation with which to build. We're committed to his proper socialization and obedience training. We believe a properly socialized pup, with as many positive experiences with friendly people, places, sounds, as possible is crucial to his confidence and future stability." "We are avid viewers of the Dog Whisperer and do in fact employ many of Cesar's techniques. I'd always adopted the "Leader of the Pack" philosophy with my dogs but Cesar truly breaks things down as to why it's so important and adds so many easy to follow and enact tips and strategies. It is our primary goal to offer Clyde a healthy and happy life but with regard to Cesar's philosophy, it will also be a life where Clyde is happy with his place in the pack." 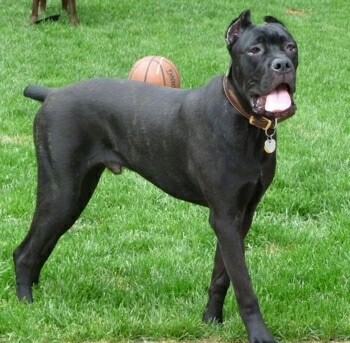 "At 9 months and about 80 lbs., Clyde still retains all of his puppy playfulness and affection." 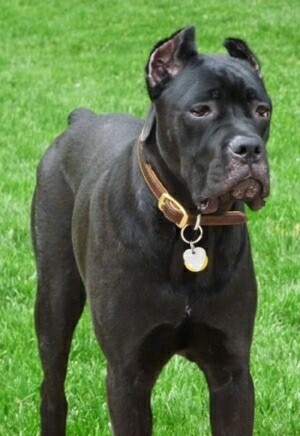 "In researching the breed, we were drawn to the claims of loyalty, fearlessness and devotion. 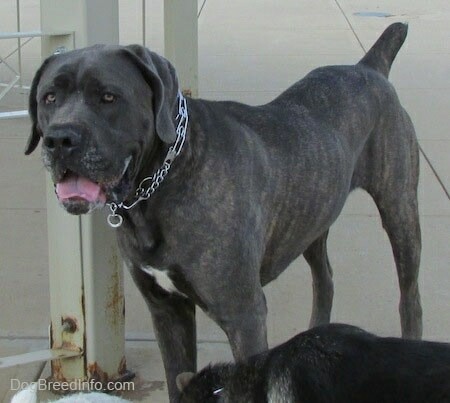 Clyde, in our opinion, admirably represents the breed's standard—playful without being too energetic, affectionate without being needy, confident without being pushy, calm and very self-assured." "With respect to the breed's size and possible dominance tendencies, we've strictly adhered to a plan for proper socialization. He's continually meeting new people, animals, and visiting new locations with different stimuli. 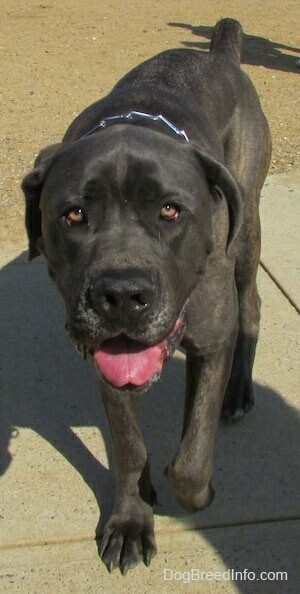 He was the star of his obedience class and is very quick to learn new commands." "He absolutely loves people and attention. He's never shown aggression or dominance toward animals however he will not allow dogs to dominate him. He exhibits excellent tolerance overall." "He has shown some prey drive. Rabbits and squirrels will get his attention but he'll go after birds with vigor. He is protective of his territory. We have a fenced-in yard but he will let it be known that he doesn't appreciate people or animals approaching uninvited. Once we greet individuals and animals though, his little nubby tail starts wagging like crazy." "He loves fetching a tennis ball and he'd wear himself out if we'd allow it. 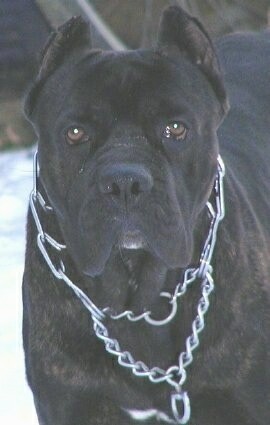 My "Cane Corso Retriever" as I call him." "We're very lucky to have such a great dog in Clyde. Together with our chocolate Lab, Carly, we have two great dogs who happen to be the best of friends." 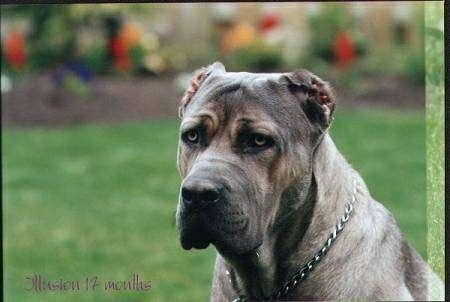 "Amir Aliado, a Cane Corso from Carbonia, Italy—his lines stem back to Dauno and Tipsi, the two dogs who were the first couple selected to get the Corso established in Italy." 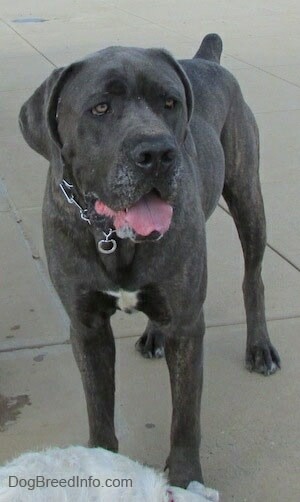 This is Goliath. 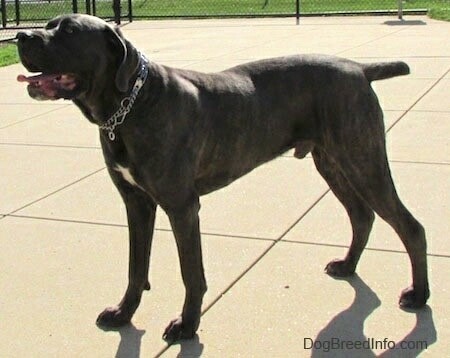 He is around 150 lbs. and a sweetie! 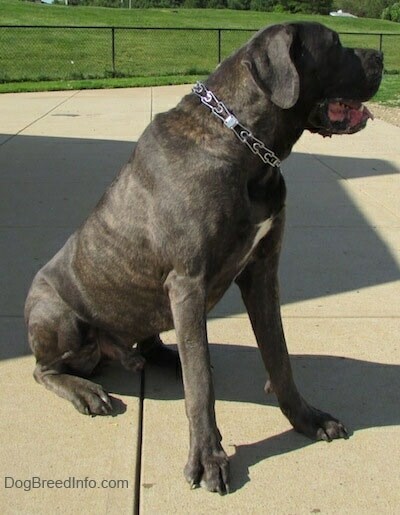 Goliath is an example of an American Cane Corso. 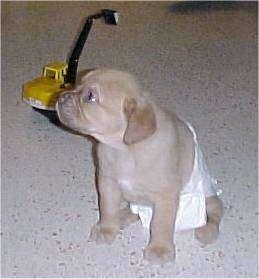 Rosso as a six-week old puppy wearing a diaper.